Vertical Cuttings Dryer is key equipment for drilling cuttings treatment. During drilling process, the customer may use water based mud for former stage operation, and oil base mud may be coming later for deep drilling operation. Some customer may buy two sets on line drilling cuttings treatment for water based mud and oil based mud separately. Some user want to reduce budget and only prepare one set on line drilling cuttings treatment for water based mud and oil based mud drilling cuttings. Hi-G dryer shaker: Hi-G dryer is popular used for water based mud drilling cuttings treatment. After Hi-G dryer, high speed centrifuge will be followed for further treating. After treated by centrifuge, solids parts can be used for construction; liquid part can be further treatment by flocculent unit. Vertical-G dryer: Vertical-G dryer is popular used for oil based mud drilling cuttings treatment. After treated by Vertical-G dryer, the solids control can be further treated by TDU; the liquid part can be transferred to shale shaker again. Or collect the liquid part into catching tank and use high speed centrifuge. Hi-G dryer is also can be used for oil based mud drilling cuttings treatment; vice versa, Vertical-G dryer can also be used for water based mud drilling cuttings treatment. Based on this, GN Solids control design it’s Vertical-G dryer which can be used for both WBM and OBM drilling cuttings treatment. In this case, the user don’t need to worry the high cost for two sets of equipment separately for WBM drilling cuttings and OBM drilling cuttings. They just need to buy 1 vertical-G dryer and 1 decanter centrifuge and 1 sets auxiliary equipment, the user can treat both drilling cuttings. 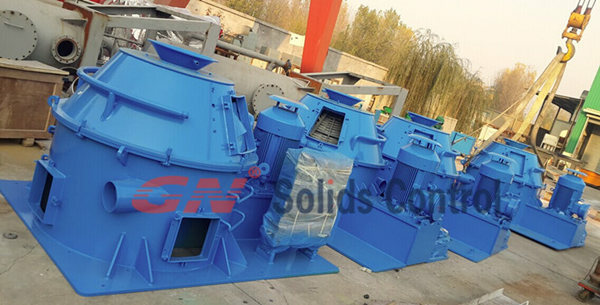 Like Swaco or CSI dryer, they can only used for oil based mud; But GN Solids Control vertical-G dryer from China can treat both. After GN vertical cuttings dryer tested by Shell, Baker Hughes project, many oil service company and mud service company come to GN for vertical-G dryer inquiry. Now we have one batch Verti-G dryer under production. For customer in urgent need, pls contact us freely.